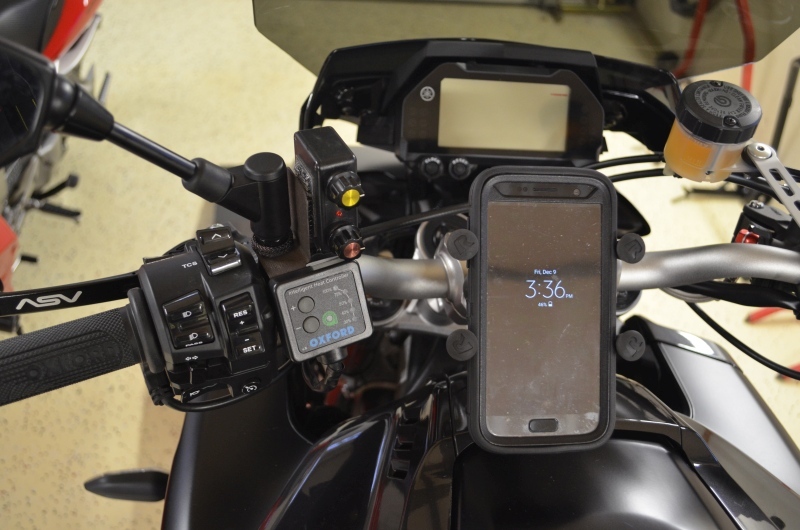 If you're running the Oxford heated grips, you'll know that their controller mounting bracket needs some modification to fit on the left side where your non-throttle hand can easily reach it. Not a big deal, but, if you're like us, you might have a heated gear controller that you'd like to mount close by. I like the Warm-n-Safe wireless controller because it can move from bike to bike easily and can be mounted wherever convenient. Anywho, the intention was to make a couple prototypes for our bikes here. But if there is interest, we'll put together a limited production run. If you have any suggestions to add more functionality, please do! I'm guessing you never produced a batch of these given the date, but it doesn't hurt to ask. I might have to try to emulate. I don't have the Oxford Heated Grips yet, but I'm definitely interested in purchasing this Bracket. Count me in! Sorry fella but I don't think a simple bent plate is worth $25. Maybe some with no mechanical aptitude or no tools or no material will be happy to pay that but I personally wouldn't. Maybe a touch less hence my vote. Manufacturing pricing occurs on a sliding scale with respect to volume. Fella. You're very fortunate to have access to such a wide variety of tools. Most motorcyclists do not. Even so, some would rather spend the cash to free up time for riding, spending time with their family, or actually making money. To those people, 'a simple bent plate' may be worth $25. Or $15. Or more. When we post threads like this, it's strictly to gain insight into what the market will bear. The thread is two years old, and frankly, your commentary about pricing isn't useful - your vote was enough. Anything else comes across as trolling. Ok, cheers for that. Didn't realise I had to agree with you. I'll not post in here again and if you wish, get a mod to delete my comments. I'm sure you'll feel better with a more balanced view in here. So much for free speech. You can guarantee I'll never put money your way! You asked in here for an opinion. I gave one! I never noticed it was an old thread. Your stuff is overpriced anyway! Like $300 odd for a kit to fit an R1 master cylinder (without the actual master cylinder). You can purchase custom made HEL lines in the UK with any assortment of banjos to suit whatever calipers you have fitted for £60 ($76) for the full system! They aren't saying you can't disagree with them, they are saying this is not the place to bring it up. If you feel that strongly about people buying pre-fabricated items, start a thread stating that opinion, then you can argue with people all you want. This thread was simply asking for interest. If you aren't interested, just simply say so. I personally dont have time or resources to make something like this so if I had oxford grips, I would totally pay $25 for this. Take care. There was no solicitation of opinions on pricing. You could have simply voted and went your merry way. Instead, you chose to use this thread as a pulpit to extol your handiwork. We are the moderator of this forum and could have deleted your posts from the onset. Contrary to your assertion, we DO believe in free speech. This is why this conversation has continued as long as it has. Thanks for further derailing this thread with unrelated discussions on pricing. Sorry to see you go. Personal comments deleted. Please feel free to tidy up this thread. Had I realised this wasn't a thread to give feedback on your request I'd not have bothered.